The SPEEDBOX is a premium quality measurement unit, but has no built in logging. Therefore, a common configuration is to connect the SPEEDBOX to a DL1, DL2 or VIDEO4, in order that the higher quality measurement data from the SPEEDBOX can be saved onto the flash memory of the connected logger. There are 2 serial ports on the SPEEDBOX, and only one of them will be connected to the logging device. In these instructions, it is assumed that Serial 1 on the SPEEDBOX will be connected to the logger; simply configure Serial 2 instead if intending to use that. If Serial 2 is not needed for other purposes, then it is a good idea to configure it identically to Serial 1 so that connecting to the wrong port will not affect the outcome. 1. Open the SPEEDBOX configuration utility. 2. Click on the �Output Serial data� tab. Set the Baud rate to 115200. This is the input baud rate expected by all Race Technology devices, so any other value will not work. Set the output rates for the RT messages that you require. Ensure that the rates selected are able to be output at 115200 baud; in particular, it is unnecessary to output any messages at 200Hz since the maximum logging frequency of the attached device will be 100Hz. An example configuration for Serial 1 is shown in figure 1 below. 3. 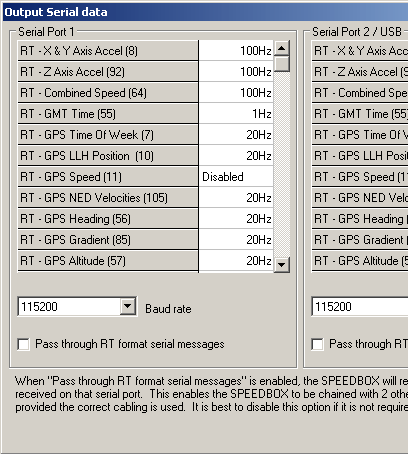 Untick the box labelled �Pass through RT format serial messages�, as shown in figure 1 below. This will ensure that no feedback loop exists between the SPEEDBOX and the attached DLx/VIDEO4 logger. NOTE: There may be some combinations of 3 or more units (eg. IMU06, SPEEDBOX and DLx/VIDEO4) where message pass-through is required. In this case, please contact Race Technology for advice. 4. Finally, remember to send the changed configuration to the SPEEDBOX, by pressing �Send configuration�. Once both the SPEEDBOX and the logger have been configured to work together, please connect them and test your logging setup to verify that the required data is being recorded prior to using it for testing.